Graduate School of Informatics, Kyoto University. She comes from Chiang Mai, Thailand. She graduated from Chiang Mai University with both a Bachelor and Master degree on Computer Engineering. Her research interest is Artificial Intelligent, Pattern Recognition, Fuzzy Logic, Computer vision and Digital image processing. 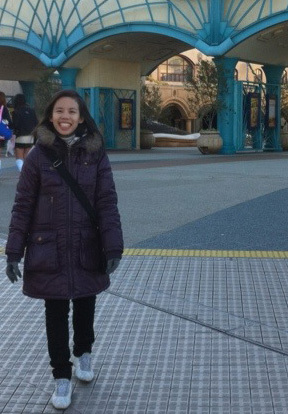 Currently, she is involved in a project in Nishida Lab as part of the doctoral student. The project is related to Artificial intelligence, Virtual Human Interfaces and Culture. S. Thovuttikul, Y. Ohmoto, and T. Nishida, “Fairness in Culturally Dependent Waiting Behavior: Cultural Influences on Social Communication in Simulated Crowds” In 10th Asian Conference on Intelligent Information and Database Systems. Dong Hoi City, Vietnam, 19-21 March 2018. COGNITIVE INFORMATICS & COGNITIVE COMPUTING ICCI*CC 2012, Kyoto, Japan, Aug. 22-24,2012. S. Thovuttikul and T. Nishida.“Handling Greeting Gesture in Simulated Crowd”, International Conference on Granular Computing GrC 2011, Kaohsiung, Taiwan, Nov. 8-10, 2011. D. Lala, S. Thovutikkul and T. Nishida. “Towards a Virtual Environment for Capturing Behavior in Cultural Crowds”, International Conference on Digital Information Management. Melbourne, Australia, Sept. 26-28, 2011. S. Thovuttikul, D. Lala, H. Ohashi, S. Okada, Y. Ohmoto and T. Nishida. “Simulated Crowd: Towards a Synthetic Culture for Engaging a Learner in Culture-dependent Nonverbal Interaction”, 2nd Workshop on Eye Gaze in Intelligent Human Machine Interaction at IUI 2011. California, USA, Feb. 13th, 2011. S. Thovuttikul, S.Auenphanwiriyakul and N. Theera-Umpon, “Microcalcification Detection in Mammograms using Interval Type-2 Fuzzy Logic System”, FUZZ-IEEE2007, London, UK, pp.1-5, July 2007. S. Auenphanwiriyakul, S. Attrapadung, S. Thovuttikul, and N. Theera-Umpon, “Breast Abnormality Detection in Mammogram Using Fuzzy Inference System”, FUZZYIEEE2005, Reno, Nevada, USA, pp.155-160, May 2005. S.Auenphanwiriyakul, S. Attrapadung, S. Thovuttikul, and N. Theera-Umpon, “Calcification Detection in Mammogram using Fuzzy Inference System”, EECON2004, Vol.2, Khon-kaen, Thailand, pp.165-168, November 2004. · D. Lala, S. Thovutikkul and T. Nishida (2011). “Towards a Virtual Environment for Capturing Behavior in Cultural Crowds”, International Conference on Digital Information Management. Melbourne, Australia, Sept. 26-28, 2011.